According to the City of Cape Town, within the boundaries of the municipality alone, there are more than 100 deaths from shack fires every year. JARED SACKS examines the root causes of the problem and the city’s failure to address it. On New Year’s morning a devastating fire broke out in BM Section shack settlement leaving about 4,000 people homeless and at least five dead. Residents claim it took almost two hours for fire trucks to arrive, despite the Khayelitsha fire station being only a kilometre away. By then, hundreds of shacks were already ablaze and the single truck that responded to the emergency failed to get close enough to the fire to make a difference. It soon ran out of water and had to leave to find more. Eventually, more fire trucks came and, with the help of hundreds of residents using buckets to draw water from local taps, they were able to slow down the rapidly spreading inferno. By late morning a strong Cape Southeaster was driving the fire, which began at about 4am, through the settlement. A single helicopter, the earlier dispatch of which could have greatly diminished the destructive force of the blaze, was able to bring the fire under control by about 10:30. Police left unattended the charred remains of three dead bodies till well after 17:00 when investigators finally returned to the settlement. On Friday, another body was discovered when bulldozers began levelling the settlement and a fifth man died in hospital. Richard Bosman of the City of Cape Town disputes this account. He puts the response time of fire-fighters at under 20 minutes saying access was hindered by residents’ personal belongings. Bosman appears to believe that the massive damage was the fault of residents themselves rather than the slow response of fire services or the complete lack of prevention initiatives by the city’s human settlements department. A City of Cape Town media release the following day claimed that city staff were continually on-site helping residents rebuild their homes. But no disaster management officials were seen in BM Section during site visits by the Daily Maverick on the afternoon of 1 January. 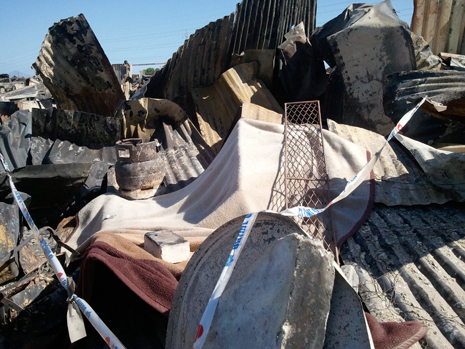 By 3pm, however, some residents had already taken to selling off their charred zinc sheets and rebuilding their homes themselves, while an array of ANC politicians and clergy made vague promises of support to passersby. Top Democratic Alliance politicians did not bother to show up to conduct the poltical play of their own or to check if victims were receiving the support they are claiming to provide. According to the online publication GroundUp, effective leadership from both parties has been absent. During a following visit by the Daily Maverick on Friday 4 January, it was discovered that disaster management officials only began to take record of the number of homeless the previous evening and were still struggling to put together a complete list of the dead. 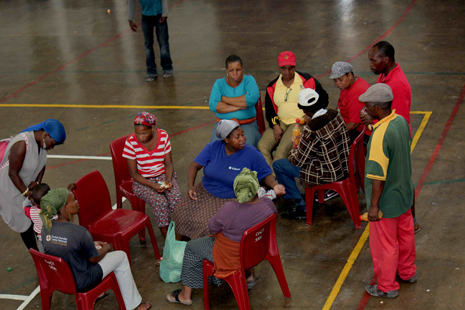 By Friday evening, there were 528 males, 591 females, 486 children and 55 babies on the list – though officials expected numbers to shoot up as working families checked in during the weekend and others returned from the Eastern Cape. Most shocking, though, was that emergency accommodation at OR Tambo Hall meant that entire families were sleeping on the cold, hard floor. Disaster management had not thought it relevant to provide victims with even the most basic foam mattress. Perhaps this is why at least half of the victims chose to cram in with family rather than stay at the hall. Community members’ accounts indicate that the fire was started by a man, said to be drunk, who fell asleep while cooking a midnight snack of boerewors. The unnamed individual and his family have since fled the settlement to avoid the fury of angry neighbours who lost everything in the fire. Still, indignant residents are adamant that government should also shoulder blame for the conflagration. Kuselo, the younger brother of both Luyanda Ngcebetshana and Lunga Krexe, who died as flames engulfed their respective shacks, says “the government always comes with its promises” of development. BM Section has supposedly been in the subject of an upgrade for more than three years now – at least that is how long ago notice boards announcing the upgrading project appeared at the section’s entrance. The signs tell residents who the tender winners for this project are, but not much else. The city’s development services department claims “good progress” is being made in the process of upgrading the area despite resistance from residents to proposed relocations. However, BM Section, like adjacent QQ Section, still lacks service roads, electricity, sanitation services and other basic and potentially lifesaving developments that have been promised. Taps, for instance, are few and far between, something residents complain hindered their ability to fight the fire. Kuselo claims he has not seen any change in the years since the upgrade began. Councillor Ernest Sonnenberg, the mayoral committee member for human settlements, has confirmed that BM Section is indeed in the process of being upgraded. Yet neither Sonnenberg nor City of Cape Town spokesperson Kylie Hatton could explain why the upgrading process is taking so long. Sonnenberg has further urged victims to rebuild their homes at least 3m apart but failed to address the fact that residents do not have enough space to do so. Longtime resident, Edward Mavakala, was furious: “It is the government’s fault. Because there are no streets here, the fire brigade could not get through [to the fire].” He says residents have been asking for this for years. If the government had delivered just the basics, hundreds of homes could have been saved. Mthobeli Qona from the Western Cape branch of the shack dwellers’ movement Abahlali baseMjondolo, who lives across the road in QQ Section, said both his settlement and BM Section, which are more than 20 years old, are among the first in line for upgrading in the City’s informal settlement master plan. 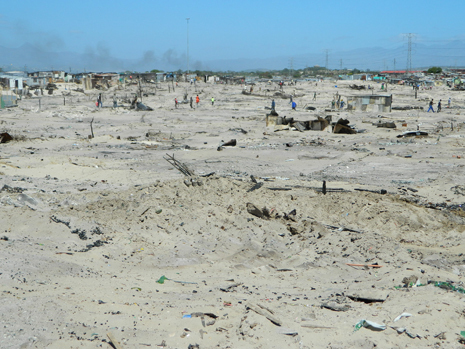 In the winter of 2007, the then mayor, Helen Zille, visited a flooded QQ Section where she promised to move residents to a site and service scheme in Bardale near Mfuleni the next year. Similar promises were allegedly made to residents of BM Section that same year. But residents of both communities say they’ve been hearing the same promises since democracy brought them politicians. They don’t understand why Zille would promise to move them to Bardale but later settle other communities on the same land. In response to the city’s failure to fulfil these promises, residents of QQ and BM Section engaged in an informal settlement strike in 2010. This year, BM Section again took to the streets during recent protests that the mayor, Patricia de Lille, has claimed are being coordinated by the ANC Youth League which, she has implied, is bent on leading a full on civic insurrection in the city. My research into the protests indicates they are being driven by popular anger at inconsequential development projects and empty rhetoric about meaningful engagement in such projects. Stoney Sithole, whose son and daughter both lost their homes and livelihoods during the fire, said that these previous protests were not about the ANC and DA. They “didn’t strike because of politics but because of need.” She insisted that her community has been promised houses for a long time. A 2008 report on shack fires in Durban by academic Matt Birkinshaw, who spent months living in shack settlements in Durban, backs up BM residents’ claims that government policy is to blame. 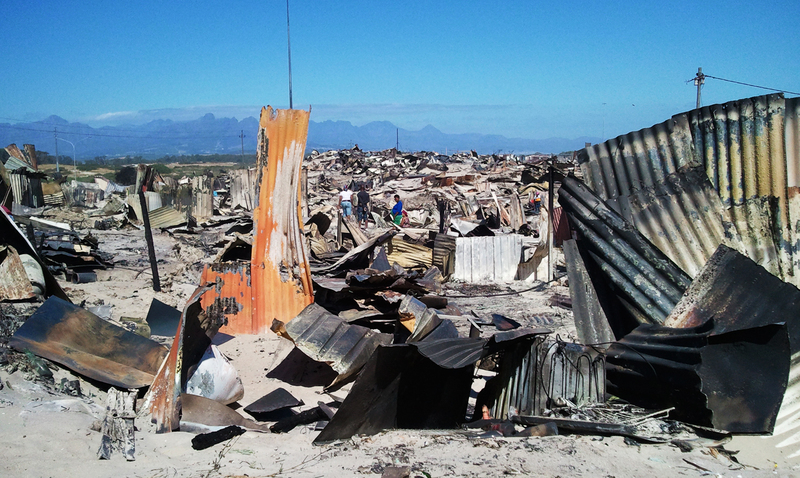 The report cites evidence that shack fires are becoming increasingly prevalent throughout the country as shack settlements grow and local governments refuse to tackle the challenge head on. Local government policy in Durban is designed to force poor residents into small and densely populated pieces of land without access roads where they are often denied electricity, proper plumbing and sanitation. Without security of tenure, residents are forced to build their homes with cheap flammable material rather than bricks and mortar. Instead of blaming the victims of shack fires, the report concludes, municipalities should be held accountable for refusing to provide the same services to shack dwellers which they provide to people living in formal houses. The root cause of the problem according to a 2008 article by Professor David McDonald is that “Cape Town’s decision makers have allocated the lion’s share of the city’s resources for the benefit of a few, leaving two-thirds of the city’s population struggling in varying degrees of poverty.” In other words, there is an economic rationale behind Cape Town’s “World City Syndrome” which, among other perverse outcomes, means that officials responded with more speed and zeal to a small New Years’ bush fire in Camps Bay than they did to the deadly and much more destructive fires in the shack settlements of BM Section, WB Section and Du Noon. Shack fires and shack settlements in general are symptoms of a wider social malaise rather than core problems in themselves.